Google Adwords Conversion Tracking – Why Haven't You Turned It On? Google Adwords Conversion Tracking – Why Haven’t You Turned It On? We’ve spoken to a few local businesses recently who have been looking for help with their Google AdWords campaigns. The conversation usually starts with a discussion around how much they are spending each month but with little idea around what return they are generating from it. These campaigns have often been set up either by the business owners themselves or by a previous agency who for whatever reason haven’t continued their partnership. Let’s imagine you’re a local shop owner in Kendal who is continually ordering stock but you keep absolutely no record of which products sell the most? If you know that a particular product sells far more than another you’re naturally going to invest more in it and display it prominently, over wasting money on something else that doesn’t sell as well. The same context can be applied to any business in any industry. You wouldn’t spend your well earned revenue without knowing what return you’re getting – so why do it with your AdWords campaigns? Do you know that through AdWords alone Google generates over $60 billion per year? It’s turned into such a powerful marketing tool and its amazing how many advertises don’t track how their campaigns are performing. Using conversion tracking allows AdWords to accurately track the performance of each targeted keyword and advert you use. A conversion could be a sale, it could be a form submission or a phone call – essentially anything you determine as a meaningful action performed by a visitor to your website. It allows you to track what’s working but crucially it allows you to clearly track your ROI. In many cases simply introducing a simple conversion type will result in you saving money as it’s likely there are many keywords you’re bidding on that are providing no return whatsoever – and haven’t done for some time. There’s essentially two different ways to go about the set up. For our clients we often already track ‘Goals’ through their Google Analytics account, and Google provide a simple (and very helpful) way of integrating the two together. This allows pre-determined Goals to also be tracked by AdWords, and you will also be able to view your PPC visitor metrics in your Analytics account. 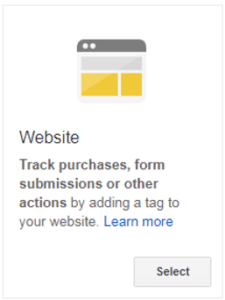 To do this log into Google Analytics, access the Admin section from the bottom of the main menu and within the ‘Property’ option you will see ‘AdWords Linking’ – if you need anything help with this please don’t hesitate to ask. The second option is a little more technical, but still relatively straight forward and can be advantageous dependent on the type of conversion you’re wanting to track (more on that below). In its simplest form, if you have an online shop, or some kind of order basket on your website then it’s highly likely you’ll have a thank you or order confirmation page. 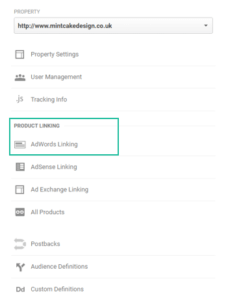 By inserting your AdWords tracking code onto here you allow Adwords to track when someone lands on it and report which search term and advert they clicked on to reach your website. It can also tell you the order value of each conversion if you have a full eCommerce website. Give your conversion a name – something you can relate it back to like ‘confirmed orders’, click continue and they you’ll be able to preview the tracking code. This will be inserted within the HTML code of the relevant page – again we’d be delighted to help you with this. 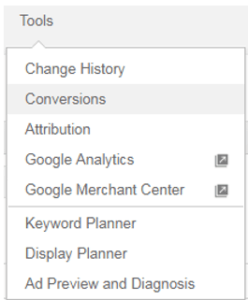 What are the different types of conversion in AdWords? As described above, conversion tracking allows you to judge how effective your PPC activity is. This is through tracking activity on your website such as purchases, sign-ups and enquiry form submissions. This is used by advertisers who promote Android or iOS apps. It allows you to track app downloads and in-app activity – such as first opens and purchases. Potentially a really important tracking tool if inbound telephone calls are essential to your sales process. It allows you view if people click your telephone number directly from an advert or from your website. You can set a minimum call length and only those calls that reach that length count as a conversion. Now you’ve got your conversion tracking all up and running it’s time to start optimising your campaigns. Monitor conversions across keywords, ads and landing pages to learn how to boost your return. From here you can allocate more of your budget to what works and work to re-evaluate what doesn’t. Don’t forget if you need the experts you know where we are! We’d be delighted to offer any advice on your ppc campaigns or indeed any part of your digital marketing efforts. Drop us email or give us a call if you want a quick chat.